When I’m not sure how to celebrate a holiday, I fall back on gluten-free cupcakes. And since my children insist upon celebrating every single solitary holiday, no matter what (they’re in it for the food), when all else fails I come up with a celebratory cupcake. 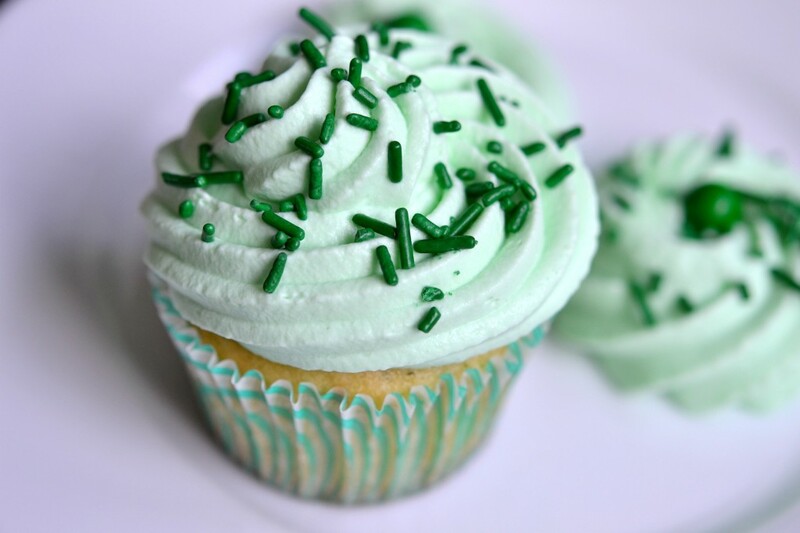 Enter … gluten-free Shamrock Shake Cupcakes for St. Patrick’s Day. I had no choice. Can you blame them? Every time I look at this overhead shot, I wanna take out a straw and drink it like a McDonald’s Shamrock Shake. 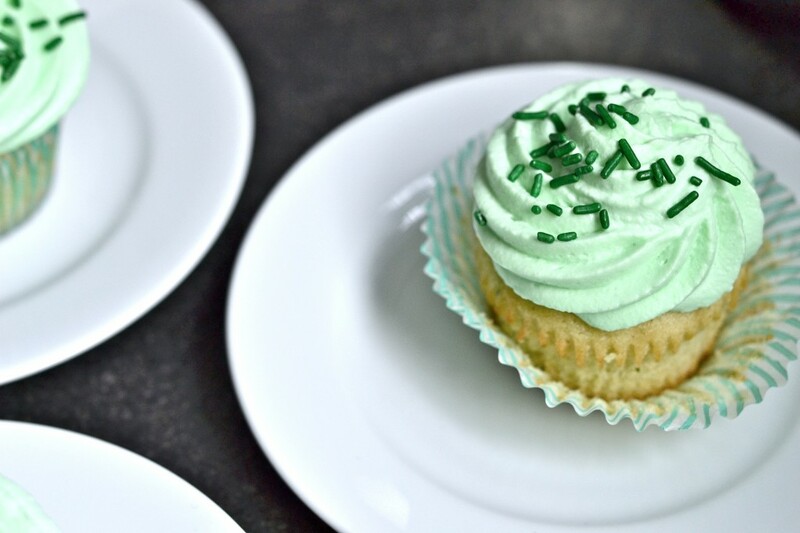 The cupcakes are mint-flavored. 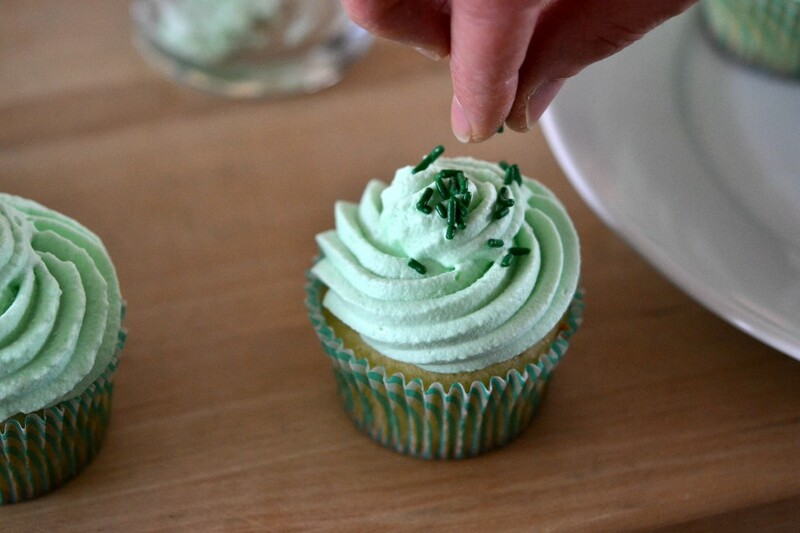 You make mint sugar much the same as we made lavender sugar with the Lavender Cupcakes from the other day. Then bake the cupcakes. See the flecks of mint? I also added some peppermint oil to the batter, to boost the mint flavor. But use that sparingly. It’s strong stuff. You could also leave it out altogether. Okay, let’s talk Whipped Cream Frosting. You can make fresh whipped cream and pipe it on there like frosting, but within a couple hours, it’ll begin to separate. You need something to stabilize it. We could use gelatin, like we did in our Gluten-Free Ho-Hos, but I wanted something to give it a little heft. A little bite. Enter mascarpone cheese, an Italian cream cheese. It makes the frosting, well, frosting. You could also use an equal amount standard cream cheese, but the frosting will be a bit tangy. Preheat your oven to 325°F. Line or grease a standard 12-cup muffin tin and set it aside. Make the cupcake batter. In a large bowl, place the flour, xanthan gum, baking powder, baking soda and salt, whisk to combine well and set the bowl aside. In a blender or the bowl of a food processor fitted with the metal blade or, place the granulated sugar and 20 mint leaves. Pulse or blend until the mint leaves are ground fine. The sugar will be a pale green color. 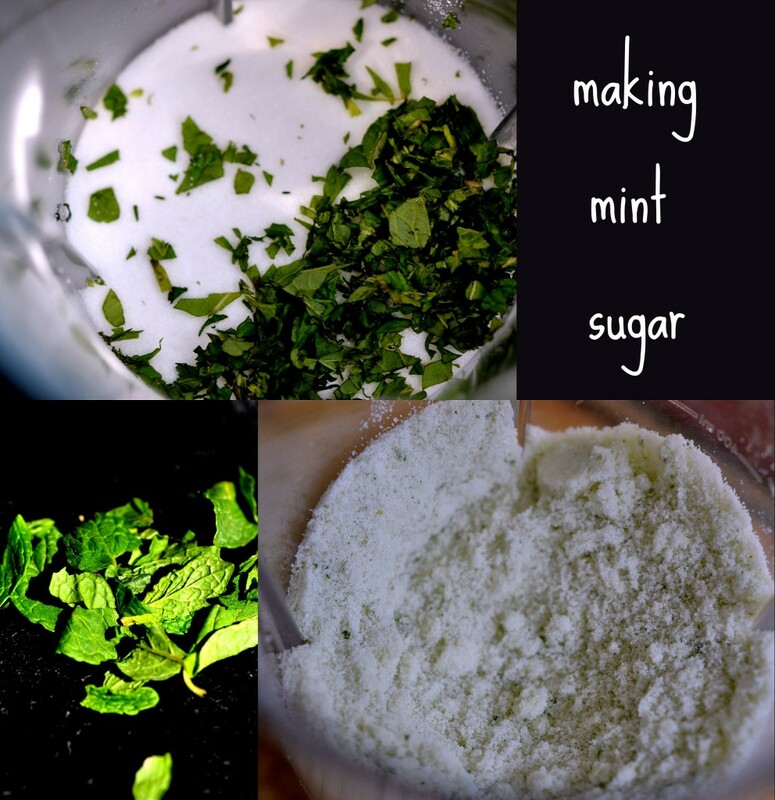 Add the mint sugar to the bowl of dry ingredients, and whisk to combine well. Create a well in the center of the dry ingredients and add the butter, milk, vanilla, peppermint extract or oil and eggs, and beat until well-combined and smooth. Mince the remaining 5 mint leaves, and fold them into the batter. Bake the cupcakes. 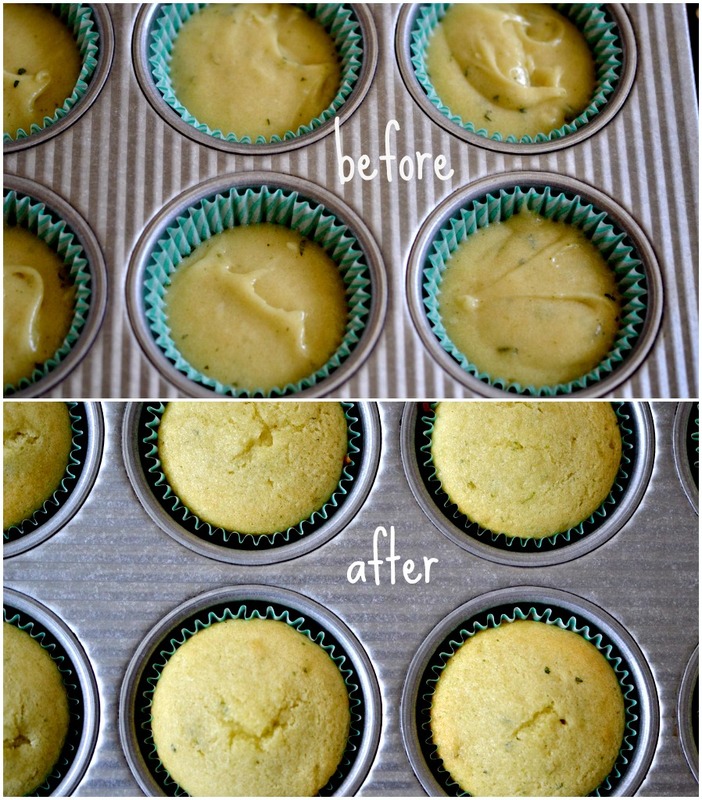 Fill the prepared muffin cups about halfway full, and shake into an even layer in each well. Place the tin in the center of the preheated oven and bake until very pale golden and a toothpick inserted in the center of the middle muffin comes out clean, about 19 minutes. Remove the cupcakes from the oven and allow to cool in the pan for 10 minutes. Transfer to a wire rack to cool completely. While the cupcakes are cooling, make the frosting. Place the mascarpone cheese and shortening in the bowl of a stand mixer fitted with the paddle attachment. Beat on high speed until the mixture is light and fluffy. Add the confectioner’s sugar, vanilla and peppermint, and mix to combine. Switch out the paddle attachment for the wire whisk. Add the chilled heavy cream to the bowl, and mix on high speed until the cream thickens and holds a relatively soft peak (stiffer than a very soft peak that falls over on itself, but softer than a stiff peak that stands straight up). Toward the very end, add the optional food coloring. Frost the cupcakes. Transfer frosting to a pastry bag fitted with a large tip, and pipe a generous amount of frosting on top of each cooled cupcake. Sprinkle with the optional green sprinkles. 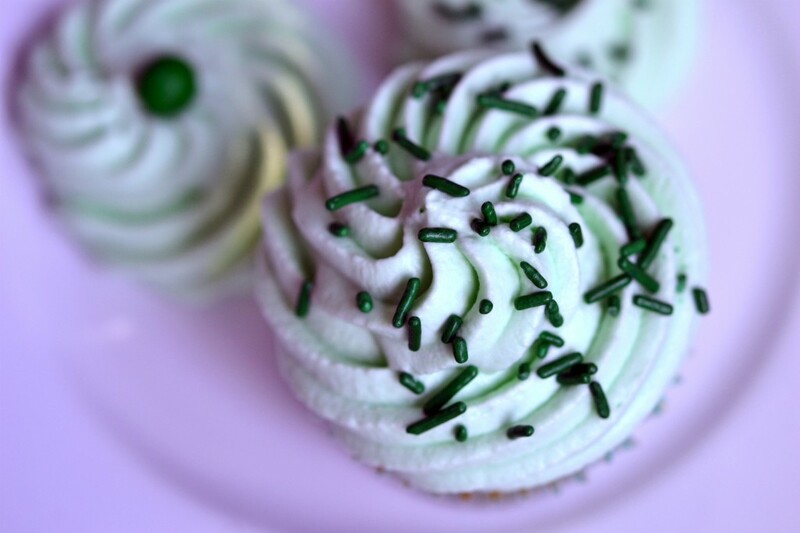 The whipped cream frosting is stable enough to sit at room temperature for about a day without wilting or separating. 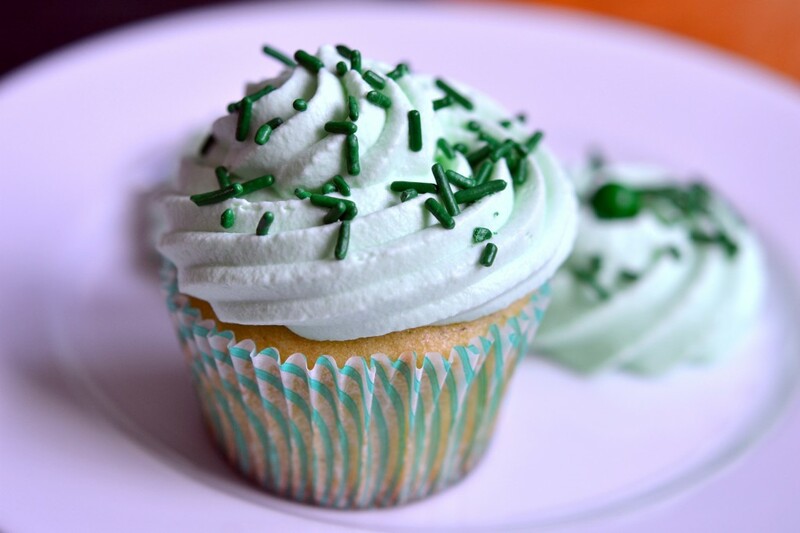 For a slightly firmer frosting, refrigerate the cupcakes after frosting and serve chilled. P.S. If you haven’t yet, please pick up your copy of Gluten-Free on a Shoestring Quick & Easy! 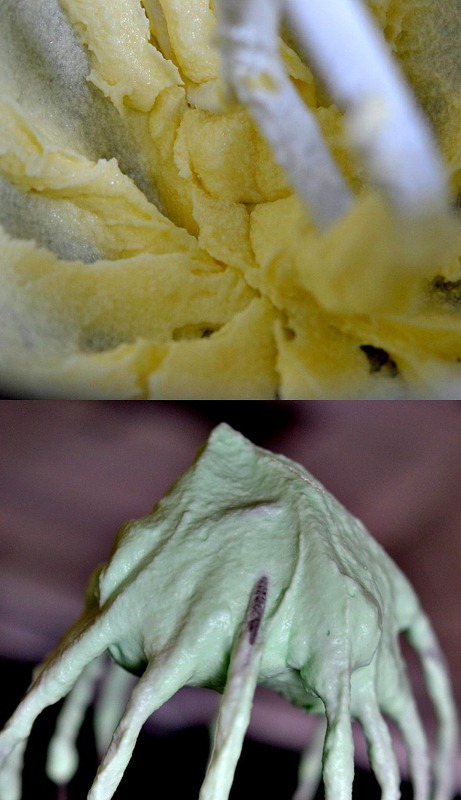 St. Patrick’s Day DIY Ideas + $0.50 Ice Cream Cones at Stewarts! Just checked today’s recipe (spent the day with friends quilting) & these look so good that I may have to try making theming this weekend! May not be green but they will be minty! Thinking of adding some coco powder instead…chocolate & mint go so well together! Nicole, love all the cake/cookies/cupcake recipes. Thanks for indulging us! We do feel your love! Ipinned it on my gluten free food to make. Thanks! p.s. I love your photos! Are you a photographer? How thoughtful of you to make a special treat to help celebrate my birthday!! I knew you cared, but I had no idea how much;) I was going to have the kids help me make a “rolo” cake for my birthday, but now I’m not sure. I don’t think I can make the dairy-free equivalent to that mascarpone whipped-cream frosting though:( that sounds amamzing! Thanks for all of the fun and delicious cupcake recipes, we love ’em! So glad you’re enjoying the cupcakes. I realized a few weeks ago that I just didn’t have that many cake recipes on the blog, so I figured I’d make amends. Believe it or not, I think you could make the frosting dairy-free. I nearly suggested it in the post, but I haven’t tried it myself so I couldn’t say for sure. For the mascarpone, nondairy cream cheese is an easy sub. The whipping cream is clearly more difficult, but not impossible. I would suggest using either full-fat canned coconut milk (with the thin liquid drained away) or MimicCreme, which is sold online and at most Whole Foods markets. You can do it, Sherry! And a big Happy Birthday to you. I have experimented w/ dairy-free frostings a bit, and they are pretty good, but not the same. I have not tried using cocnut milk in a frosting though, I bet that would be lovely(but vegan cream cheese is not as lovely as mascarpone, it just isn’t). I did make a pretty successful dairy-free caramel sauce in prep for making the rolo cake. I just subbed out the regular canned coconut milk for the heavy cream, and 1tbs earth balance + 1tbs Spectrum shortening for the butter. Not bad at all! Thanks again for all of the great recipes, and all of the pointers on how to handle my family’s food restrictions. I have learned so much and come so far due mostly to your tutelage! I hope you can feel the love. You’re so welcome. I can most certainly feel the love. And it means a whole lot! Have you tried MimicCreme before? I haven’t tried it myself, but I have heard really good things about it. It might be worth a try just once, so you know. I agree that vegan cream cheese just isn’t the same as mascarpone. Pity! I think full fat canned coconut milk, drained of of its excess liquid, might work quite well in this, actually. I’m glad you found a good workaround for the Rolo Cupcakes. You shouldn’t miss out! I would make these today… but since today is pi day (3.14), I will need to make those little apple pies tonight! I think that’s a logical choice, Ashley. ;) Those little handheld pies won’t disappoint. Oh how I wish my mint was up!!!! I am definitely filing this one away for when it is ;) . I made the rolo cupcakes yesterday…..BIG hit!!! We’re talking HUGE….even with my non-gluten free friends :) . I wish I could have picked mint from outside my front door to make these, but I had to buy some instead. Growing herbs is my most favorite part of warm weather (and I’m really not a warm weather person at all).